Some guitarists prefer the sound that they get from the acoustic guitars while others may love electric. There are brands that specialize in one or the other, so that is something that is very important to remember when you are deciding on the various guitars that are available on the market. 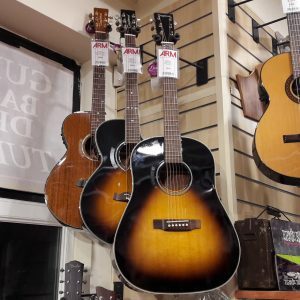 One option that you should consider, especially if you are looking for an excellent acoustic guitar, is Tanglewood guitars. Come down to our physical location to try out Tanglewood guitars in Nottingham to see if this is a perfect choice for you. Read on to learn more about this brand. Tanglewood Guitars is a stringed instrument manufacturing company that was founded in 1988 in London. This British company specializes in designing and manufacturing a wide range of stringed instruments including bass guitars, classical guitars, electric guitars, and acoustic guitars. While they have become a popular guitar choice on the market, this brand is arguably one of the best and most respected brands of acoustic guitars. What makes these guitars stand out so much is that it combines traditional designs that people love along with modern innovations, which make them great for guitarists of all levels. Before you get into the guitar buying process, be sure to consider the amount of money that you actually want to spend. The prices of guitars can range from affordable to “break the bank”, so a budget is important to help you narrow down your options. Tanglewood offers a wide range of acoustic guitar options that can fall within practically anyone’s budget. Some would even say that Tanglewood guitars are the best value when it comes to guitars on the market. Think about your skill level and your intentions for your guitar, and you will be on the right track to finding the best guitar for you. The various electric and acoustic models have different body styles and necks on them, something that is really important to keep in mind. It may be tempting to just purchase one online without checking it out but because of these differences you may end up spending money on a guitar that does not work well for your needs. Rest assured though, no matter which guitar you end up with in the Tanglewood family of guitars you are still going to end up with a high-quality instrument with amazing sound. This company is popular for a reason and they have high standards for every single guitar that they manufacture. You always need to try out any guitar before you spend the money on buying one. Every guitar and musician are different. The only way to be able to tell if a guitar is the right one for you is by going to the store and playing it. Pay close attention to the distinct sound quality that it has. Does it fit with your style of music? How does the guitar feel as you play it? You want a guitar that sounds right for the music that you are trying to create as well as one that feels comfortable while playing it. Not looking for Tanglewood Guitars? We also have other Guitar Brands.